1. Discard anything that has a typical ‘ELASTIC WAISTBAND’ : Trust me when I say this, waist bands are not for anyone with belly fat. The reason is simple – waistbands form a noticeable bulge below the region that it is placed,making your belly fat all the more visible. 2. Show off your LEGS : If you are short n stout , show off that leg.. surprised much ? Let me explain – knee length or midi skirts are the ideal. Showing off some part your leg or at least your ankle & feet goes a long way in making you look taller and thinner tooooooo ( trust me on this) . If you chose to go maxi pair it with some heels and make sure it’s not wiping the floor after you. If you chose to go mini, match it with knee or thigh high boots as these will create the illusion of longer and slimmer legs. But whatever skirt you wear, it should be well fitted at the waist. The WAIST is the most important part of your body that gets highlighted in a skirt. 3. Go A-LINE / FIT & FLARED : Well-fitted at the waist and rest should be lose, flowy and flared. 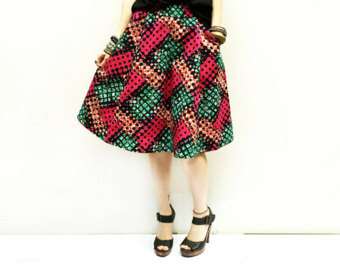 The flare aspect of any skirt will help you hide that tummy n thighs and the basic cut will give your body a nice shape. Moreover it will allow you to tuck in your top or blouse giving you that perfect curve around the waist. Please keep in mind that while they have some flare, it’s not too much. And with your fit & flare skirt , make sure that the fit part of it isn’t making your stomach bulge. 4. Make it DARK and/or PATTERNED : Yes, we have all heard it – ‘Dark Colors makes one look Thinner’ and it’s true. Go basic. Most Indians have issues in their tummy region and thighs, so no need to go light-colored their. Also patterns help break the color and gives a slimmer illusion. But make sure it’s not horizontal. Anything horizontal will make you look plump, so however cute that horizontal pattern is, it’s a strict No No. 5. 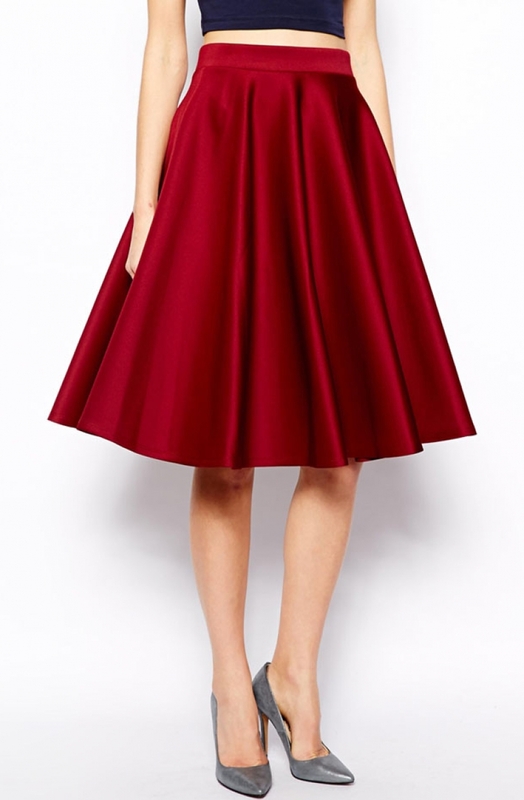 Don’t FLARE it much : While A-Line skirts are excellent for stout people, make sure that there isn’t too much of flare. 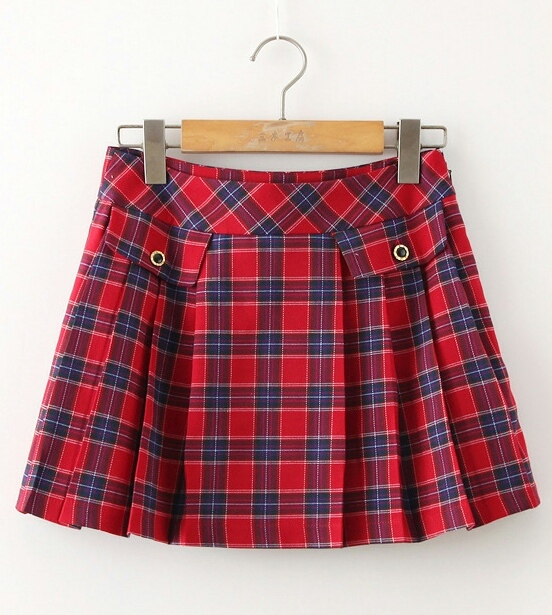 This will kill the entire purpose of wearing skirts and you will end up looking short n fat. The thumb rule for flare is – less pleat , preferably no inner lining , and most importantly once you wear it – it doesn’t look either like a ghagra(too much flare) or a petticoat(too less flare). Too much flare = Too much volume = Look Fat. 6. Make it to the TOP : Well, once you get that perfect skirt you need to know that perfect top to pair it with. I say a tight or shapely top (preferably tucked in) with a flowy skirt is the best choice. You can also wear a shirt but tucking it in is imperative. With skirts your entire emphasis is on the waist, remember that. Well, if you are still unsure , just send me a pic of your skirt and yourself and I will try my best to help you. Hey, have fun with it !! Monsoons – aren’t they the BEST ??? There’s an innate urge to go sit by the window and relish the downpour with a bowl of delicious crunchy snack on our lap. Snacks, they make the rain more special and without them the joy that rain brings remains inadequate. But, have you ever tried to think beyond the conventional pakode? Probably not!! There’s always more you can do with your snack. Today, I’m going to show you how you can experiment and can make unconventional use of your kitchen appliances to whisk up lip-smacking snacks and make your monsoons more special. Let’s make DOUGHNUTS !! I have used my newly purchased Bajaj Airfryer. First, preheat the Bajaj airfryer to 180c. Then whisk butter, self raising flour, caster and brown sugar together in a mixing bowl. Separately mix milk, butter and egg. Now gently mix the second bowl into the first. Just combine the ingredients and do not over mix it. Next remove the center portion from the doughnuts to make them look like pre-cooked doughnuts. Place the doughnuts on a greased baking sheet inside the Bajaj airfryer. Cook for 15 minutes at 180c. Alternatively you can check if they spring back when lightly pressed. Let them cool for 5 minutes and meanwhile you can start on the icing part. Prepare a creamy mixture by slowly adding icing sugar to the butter cream. Add blended strawberries and food coloring to whipped cream and mix. Top up the cooled doughnuts with the colorful delicious icing and serve with a smile! If you have a few unusual snack hacks up your sleeves, Bajaj Electricals has something exciting in store for you. Head to Bajaj Electricals’ Facebook and participate in the #HackTheSnack contest to win assured Grofers cashback vouchers, Bajaj Air-fryer, Sandwich Maker and much more!